cartridge exchange which allows the soldering robot using different tip geometries to get the Highest Soldering Quality or automatically changing the cartridge when the one being used wears out. sets for flux core perforation are available allowing flux flow and outgassing to minimize solder splashing. are available with metal or plastic bristles. The NEW Soldering Unit HA245 for General Soldering makes available to the Electronic Industry the first selective soldering solution featuring Automatic Cartridge Exchange. 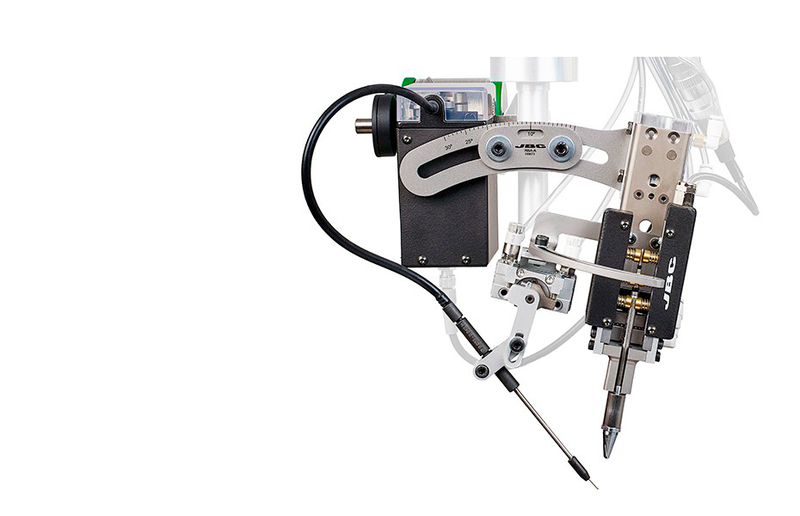 The New Automatic Soldering Iron TRA245, in combination with the Cartridge Stand CS2R245, features automatic cartridge exchange which allows the soldering robot using different tip geometries to get the Highest Soldering Quality and automatically changing the cartridges when the one being used wears out. The Solder Feeder SFR, assembled on the RBA Soldering Head, includes solder wire perforation function, allowing flux flow and outgassing to minimize solder splashing. The Tip Cleaner CLMR with its 50 mm (1.97") diameter brushes thoroughly clean the soldering tip in just 1 second increasing its heat transfer capacity. To establish the communication between the UCR245 Control Box and a Robot (PC or PLC) JBC provides the RS232 Communication Protocol for UCR. Download at www.jbctools.com/jbcsoftware.html. R245 Cartridges and Guide Tube Sets GSFR are not included.